Flagship offers new tires for sale in Baldwin, WI. If your vehicle requires new tires or maintenance, we can help get you back on the road safely and quickly. Our dealership offers the most popular and trusted tires in Baldwin, WI. Expert technicians make sure that your new tires are the perfect match to your vehicle and driving needs, whether you have a car, truck or SUV. Worn tires can cause a number of problems and be a potential safety hazard, so it is important to have your tires inspected often and replaced if needed. 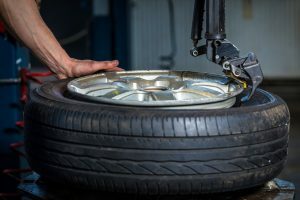 When tires are worn out, they are more likely to puncture, hydroplane, leak air and blow out due to heat build-up, in addition to increasing stopping distances and compromising your car or truck’s handling. Visit our service center and check out our large selection of new tires in Baldwin, WI.